"In the past we set up scaffolding to create archways at events, which was very labor intensive. Safety was a major concern." 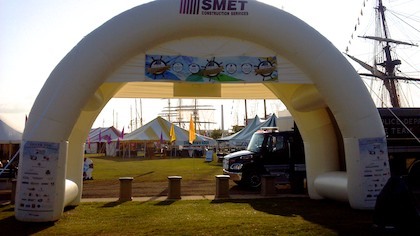 This year, however, SMET Construction brought in Landmark Creations to develop a custom inflatable archway. This modern, sleek entranceway was fit with custom signage that could be changed up, depending on the different events at which SMET was exhibiting. Because of its size and unique shape, the inflatable arch made the perfect backdrop through which visitors could pass. Was the archway the huge hit SMET hoped it would be? "The inflatable arch allows for safe and easy setup and takedown. People have raved about the arch and have made requests to have it at their events," reports Karen. I'd say that's a resounding yes! Looking for more inflatable ideas for your next fair or festival? Browse our online galleries!